Father’s Day is coming up shortly and if you’re like me I never know what to get my husband. 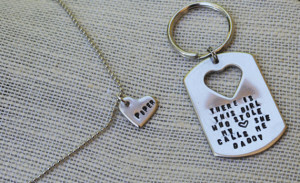 It takes me forever to find something and usually when I think I found the perfect gift I change my mind a million times. I’ve always had trouble shopping for men! But this little list should help you or give you some great ideas for the perfect gift or craft for daddy this year. I’ve shared some of my favorites and a free printable craft your little one can do that my kids and I will be doing this year! 1.Contigo AUTOSEAL Kangaroo Water Bottle with Storage Compartment, 24-Ounce, Blue – This is something my hubby would personally because he goes to the gym every day. 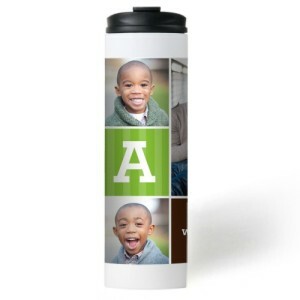 This water bottle features autoseal technology and a compartment for your gym card, id or keys! 2. 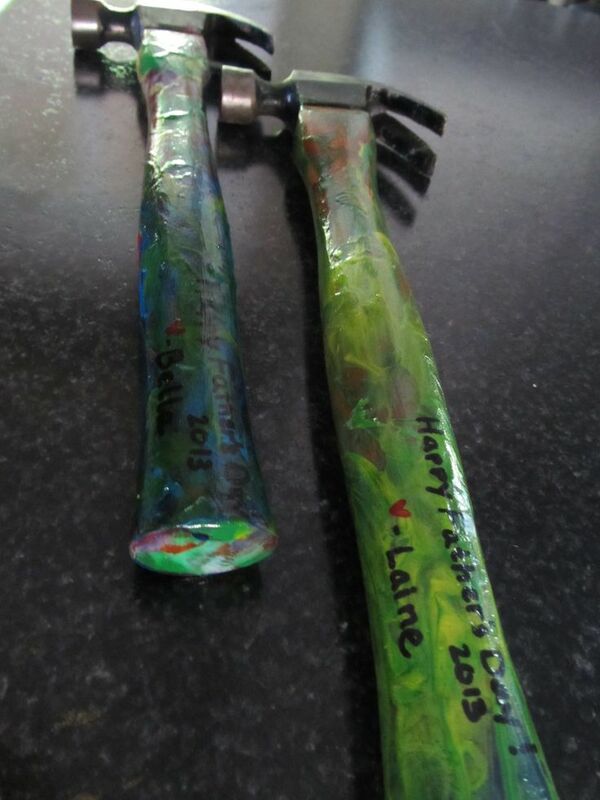 Personalized Hammer for Daddy – A cute way to personalize one of daddy’s favorite tools grab some paint or markers and let your kids be creative! 3. 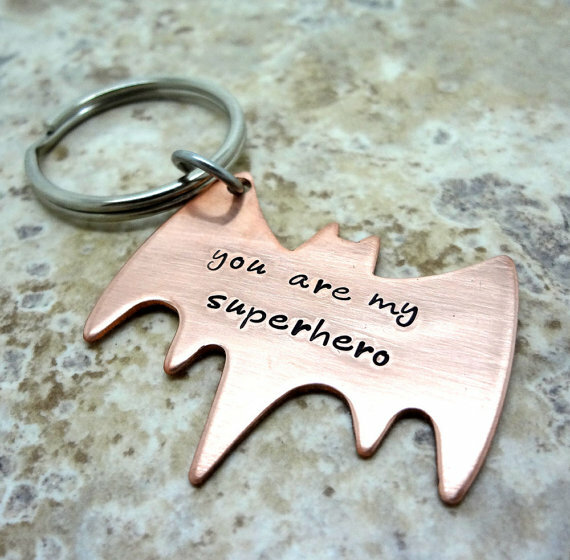 Super Hero Key Chain – This would be a cute gift from daddy’s little boy! 4. Daddy Daughter Key Chain/Necklace Set – A gift for daddy and daughter, this set is adorable and what little girl wouldn’t want to wear a necklace from daddy! 5. 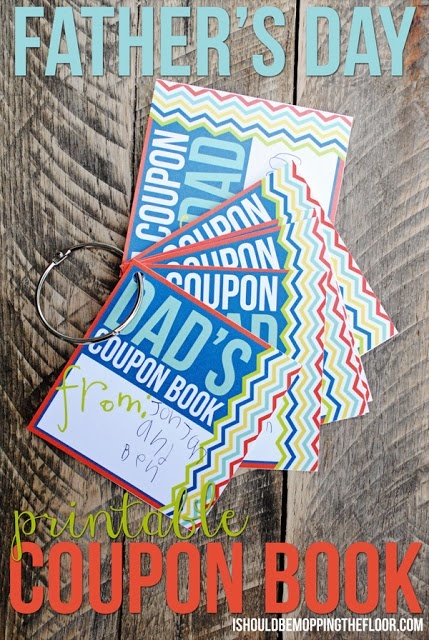 Father’s Day Printable Coupon Book – If your looking for some cute frugal gift ideas this free printable coupon book is perfect! 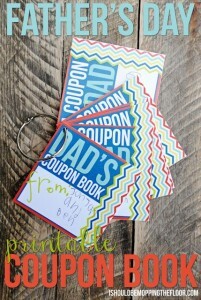 And what’s great about this set is that each coupon is blank so your kids can come up with coupon ideas for daddy! 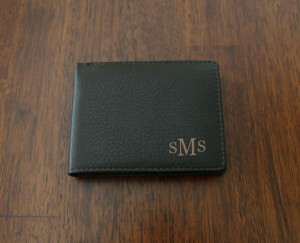 Personalized gifts are so much better. Check out I Should Be Mopping The Floor for the printable! 6. 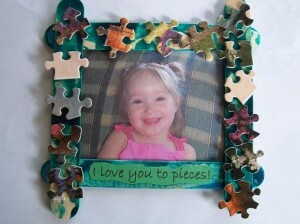 Love You to Pieces Frame Craft – A cute and easy craft for your little ones that involve items you probably already have and daddy can show off some of those adorable pictures :] Check out Our Crafts n Things for the tutorial! 7. Easy Toddler Father’s Day Craft – This craft is great for the younger kids because they can just go crazy with it. You use painters tape and some paints to create this little master piece! Check out Thriving Home Blog for the tutorial! 11. Birch Box Monthly Men’s Subscription – I love my Birchbox that I get monthly it’s a great way to pamper yourself especially when your a busy mom who sometimes forgets too. 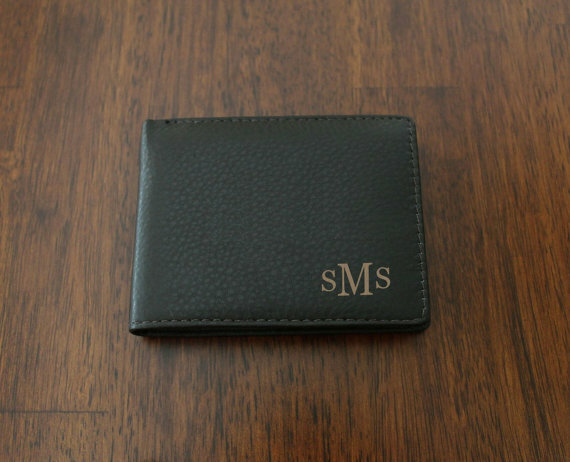 So I love the idea that they have a mens version too instead of just a gift for this father’s day remind dad every month to pamper himself and show him how much you care! 12. Clicker 2-in-1 TV Remote and Bottle Opener – I shouldn’t be surprised that they have a remote control like this but let’s be honest, what man wouldn’t like this gift! 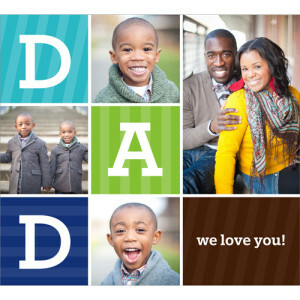 And finally here’s a free printable craft that my kids and I will be doing this year for Father’s Day. It’s super easy just print out the PDF file and have your kids place their hands in some paint to create some hand print’s on the printed image! 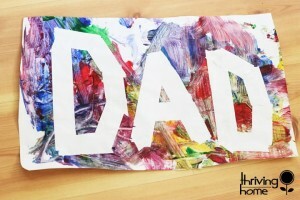 A cute little craft for dad that the kids will love to do! 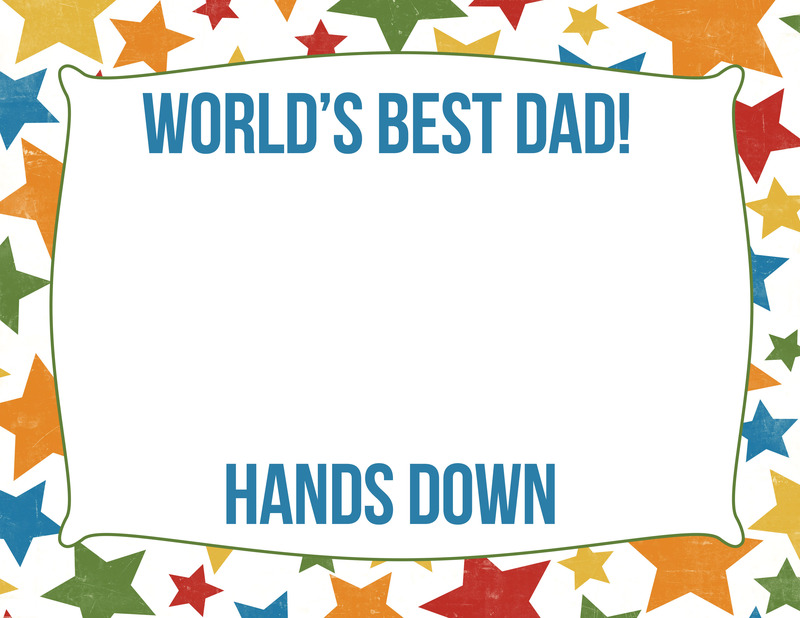 Click Here to get your free Best Dad Printable and make sure to subscribe to get exclusive monthly printables! I love the personalized hammer gift idea. That is really cool! I just wrote a post on gift box subscriptions, and I think BIrchbox is an excellent choice for the fellas. Love these ideas and very creative. Thank you for sharing! Did you just use acrylic paint? Also, did you put anything on it to make sure the paint didn’t wear off? Sorry about so many questions. I want to do this and would love to know what worked out best for you. Thank you so much for your help! I love the father daughter necklace-keychaing combo. Thank you for posting. I love the painting, I guess this is something memorable that the dad could keep for ever. My favorite fathers day gifts were always whatever my kids made me..
My husband would LOVE that batman keychain! 🙂 Thanks for sharing! I love the hammer idea. I love this post because I always have a hard time thinking of ideas for my dad especially. Thanks for the ideas. The batman keychain is my favorite. Very cute ideas. Birchbox for Men??? Awesome! And I hadn’t thought about a water bottle. My husband is in need of a new one, and it didn’t hit my radar as a Father’s Day gift. Great list! These are some very helpful ideas. Thanks!